Flexible Design. Versatile Use. Playful Spirit. As part of the Wilsonart Contract Portfolio, Wilsonart Solid Surface offers you incredible opportunities with true freedom in design. Composed of minerals, acrylic resins and proprietary coloring agents, Wilsonart Solid Surface is easily and readily available in a broad range of designs and colors that won’t fade or wear away and that can be renewed or repaired if damaged. The durable engineered material also invites dynamic shapes, elegant inlays, and a nearly limitless offering of design options. Available in a wide range of colors and designs, Wilsonart’s 100% acrylic solid surfaces are ideal for a wide range of environments, where you need a surface that looks good, performs well, and provides options that no other surfacing material can. Imagine the possibilities: a surfacing material that gives you design versatility, renewability and repairability and the ability to virtually eliminate seam issues. Available in 50 colors and designs. Sleek, integrated sinks are more than just beautiful: they work hard too! Clean up is a breeze when you can wipe crumbs and spills right into the bowl with no lip or ledge to catch debris. 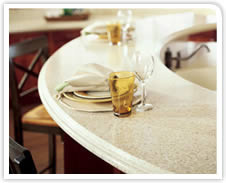 Now, you can get the look and performance of an integrated sink for Wilsonart® Solid Surface countertops. Wilsonart’s integrated cast solid surface double sinks, bar sinks and lavatory bowls come in a variety of styles and feature a smooth, clean transition for seamless designs and easy maintenance. Or, look at new Wilsonart®HD® Integrated Sinks which offer a truly unique, finished look when seamed into Wilsonart Solid Surface.